After just finishing the brilliant 4 hour documentary on the Elm Street franchise, Never Sleep Again, I went out and bought every single film from this series. It was more of an excuse really as I hadn't seen any of the earlier films in at least ten years or so. But if you haven't yet had a chance to check out the excellent Never Sleep Again, I strongly suggest you do so. Thoroughly entertaining and informative on every single aspect of the entire franchise from the first film to Freddy vs. Jason to the television series and everything in between, Never Sleep Again will have you dusting off your Nightmare films and popping them in. I've probably seen this original Nightmare on Elm Street close to 100 times to date. Growing up in the 80's as a kid moving into teenager-hood was probably the best era in terms of horror films. You honestly couldn't have asked for a better time to be a teenager and to be into horror films. Most of them around this time were originals or sequels, not like now where they're all pretty much remakes and needless ones at that. All they end up doing is showing you how inventive and creative the originals were and what they did with a quarter of the budget without digital effects. Case in point, the Nightmare on Elm Street remake from 2010. If there was ever a needless remake that offered "nothing" to the franchise or the story, ANOES (2010) was that film. I guess since they were on a roll with remakes like The Texas Chainsaw Massacre, Halloween and Friday the 13th, they felt they needed to complete the list of all time horror franchises. I'm not totally against remakes in general, but do feel that some films just need to be left alone like The Thing and Fright Night. If it's not broken, why fix it!? I quite enjoyed Friday the 13th (2009) much more than I thought I would though, even though the whole thing about Jason taking a hostage made absolutely no sense whatsoever. And I liked the TCM (2003) and TCM: The Beginning (2006) quite a lot too.Of course those were more style over substance, but they were a fun watch nonetheless. Watching the original Nightmare on Elm Street this past Sunday reminded me of how great this film was, from the casting to the practical effects and to Wes Craven's creative genius. From beginning to end this is a creepy film with some pretty outstanding sequences and no matter how many times you've seen it, still manages to impress. Ok, so they never explain how the hell Nancy is able to pull first Freddy's hat and then Freddy himself out of her dreams and into the real world, but it's a fun concept and gave Nancy an opportunity to go all MacGyver on Freddy in the finale. What I found even more fascinating is that she was able to do this all in the span of 20 minutes, because from the time she calls her dad and says to check up on her in exactly 20 minutes to the time she's pulling Freddy out of her dream, she was able to construct all these booby traps, fall asleep and bring him into the real world. If anything it shows that she utilizes her time very wisely. Pretty much the entire cast is pretty great in this. I always had a crush on Heather Langenkamp and John Saxon was awesome as Nancy's dad. Johnny Depp does what he can with the "jock" role and teaches us never to fall asleep with a set of headphones on and a television sitting on your lap. That sequence along with the music accompanying it is still pretty freaking awesome and disturbing. As is the scene where Nancy's friend Tina is attacked by an invisible Freddy in bed while her boyfriend helplessly watches as he slices and dices her to death. The music played to that sequence is pitch perfect and still creeps me out. The real kudos obviously goes to Robert Englund as Freddy Krueger. It just goes to show you that despite a ton of makeup, it's still the guy you hire to don the makeup and not the makeup itself who scares the bajeezus out of you. I remember how for part 2, in an attempt to save money and not wanting to pay Englund what he was asking for to reprise the role of Freddy, the studio hired some other guy who mostly stayed in shadows. I think that only lasted like a week before they realized they made a huge mistake and paid Englund what he wanted to come back. There are a few scenes with this other guy still in the film and if you look closely, you can totally tell. He looks different and walks different with more like a weird wobble. No matter how many times I see it, the original still delvers the goods. I always remember Part 2: Freddy's Revenge always being my favorite, but as I'm going through this in chronological order, that will be my next one and we'll see if my memories still hold true. 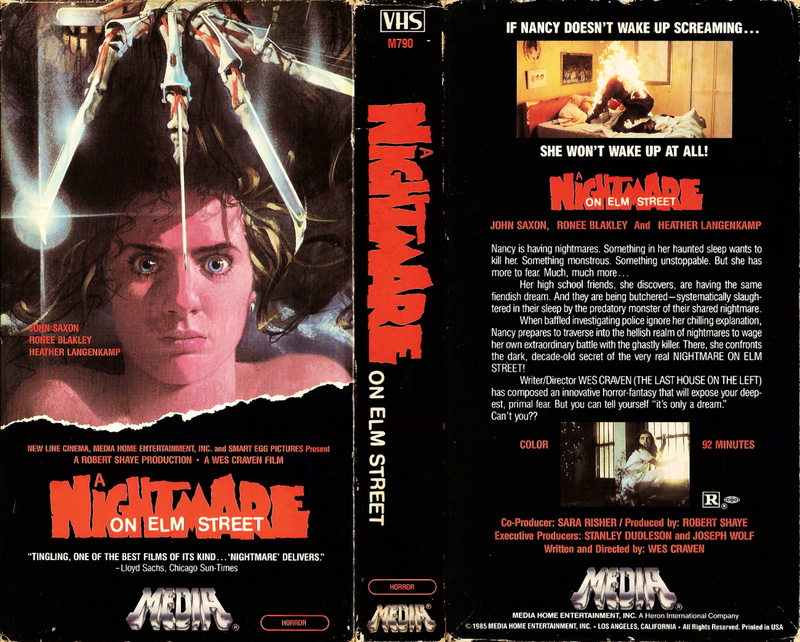 Thanks again to Jayson over at Basement of Ghoulish Decadence for the VHS cover scan. I love this one too. My friends and I always sing "It's ranin' Depp, hallelujah it's rainin' Depp" after his death scene, and that song at the end is hilarious "It's a nightmare!" And I agree about the remakes. I wonder, which would be the better investment, spending the money to remake something like this, or to clean up the original and re-release that in the theaters instead? Pretty much all of the recent remakes have bombed (Fright Night, The Thing), yet they keep making them. I just don't get it. I honestly thought The Thing was perfect, even thought it's almost 30 years old. It doesn't look dated or anything and thought or assumed it was "untouchable". But of course "someone" always thinks they can do better and it just goes to show you that they usually cannot. I never even gave Rob Zombie's Halloween remakes a try. I don't like his style of filmmaking and didn't want to see his hillbilly take on a well loved horror franchise. I totally agree that the studio's money would be much better spent on cleaning up old prints and re-releasing them in the theaters. I think there's a market out there for it. I know I'd jump on the chance to see one of these old films back up on the big screen again. If there is money to be made, nothing is untouchable for Hollywood. Sad, but true. They don`t care about "our"feelings. About NOES.. the first one brought the idea to the table, and it had a few great scenes, but I still like 3 and 4 the best, the second too, has certain qualities to it, that are very much worth watching...later, the mask that got more fake looking with each sequel? I didnt like that at all. Well, plenty topics to touch , once youre goin at it...never seen a better making of marathon than never sleep again!!!! I completely agree with you. I remember liking part 2 very much, but have the best memories of part 3 and 4, which means I watched those more often than any others. I never saw part 5 because it didn't appeal to me in the least, first starting with Freddy's makeup. It looked horrible and I thought was a really bad decision in changing makeup artists. I'll always associate Freddy with makeup artist Kevin Yagher's version of his makeup. Whoever they got to do part 5 did a horrible job. First is the best for me, it's the one that does actually do it's job of scaring the audience. After that the franchise became more fantasy orientated and less interested in the horror, at least until New Nightmare which I thought was really interesting. I do really like 3 and to a lesser extent 4, but not so much on the others. Must track down Never sleep again, I haven't heard anything but good things about it.